When school is finally out for the summer, you can almost hear a collective sigh of relief from college students everywhere. For undergrads, this is a time to celebrate a few months of freedom from all-nighters in the library, and to make a toast to your hard work throughout the past year. For recent graduates, like myself, this is a time for slight panic, withdrawal from your college friends, and bouts of crying while listening to “Graduation” by Vitamin C. Either way, I think we all deserve a drink. 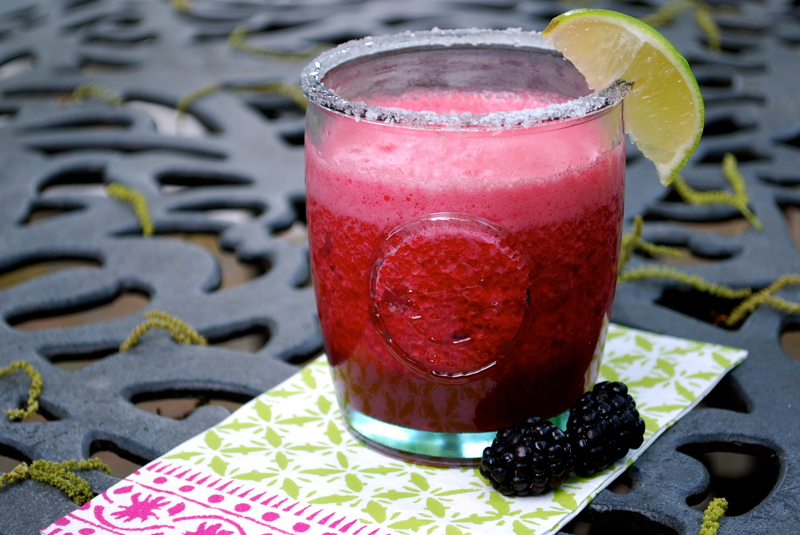 To welcome the beauteous warm weather that’s finally upon us, I propose sipping a livened-up margarita featuring tart and juicy blackberries. This refreshing drink packs a bright punch of citrus that complements the sweet berries, and has a mellow hint of tequila in the background. Pour a glass of this stuff over ice and kick back on the porch to truly soak in the sweetness of summer. School and the real world will be the last things on your mind. Hannah Doolin recently graduated with a degree in magazine journalism from Syracuse University. She hopes to spend at least a few summer days with her toes in the sand and a margarita in her hand. In a shallow dish, combine the sugar and salt. Rub the rim of each glass with the cut edge of a lime wedge. Dip the rim of the glass into the sugar-salt mixture; set aside. In a microwave-safe cup, combine 1 cup water and sugar. Microwave on high until the sugar completely dissolves, 1-2 minutes. Stir and set aside to cool. In a blender (or, my favorite, a Magic Bullet) combine the syrup, tequila, Cointreau/triple sec, lime juice, and blackberries; process until smooth. If you have one on hand, pour the mixture through a fine-mesh strainer set over a large pitcher, pressing on the solids to extract all the liquid. If you don’t have one, don’t fret, you’ll just get a slightly more frothy end product with seeds in the bottom. Serve immediately over crushed ice or refrigerate for several hours or overnight to allow the flavors to develop. Categories: Blog, Creative Cocktails, Drinking, Featured, and Recipes. Cooking Method: In the Microwave and Make Ahead. I Don't Have Any: Cooking Skill and Kitchen Access. I'm Cooking For...: BBQ, Cinco de Mayo, Dates, and Myself.